1st: remember to sign up to create your account, and add your app information and ad placement. Unless you have one we cannot track your ad impressions, clicks, etc. You can still implement the ads, but not going live. Summary: this project contains the source code for the Android library for Pocket Media Native Ads. The library lets you integrate the ads without effort, and being able to customize everything about them. Can I use the library without building the source? To know about the different methods available and how to start, take a look to the sample project. The project is made for Android Studio. 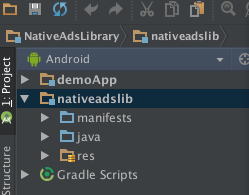 Once imported, you will find two different modules: the demoApp, and the nativeAds library project. 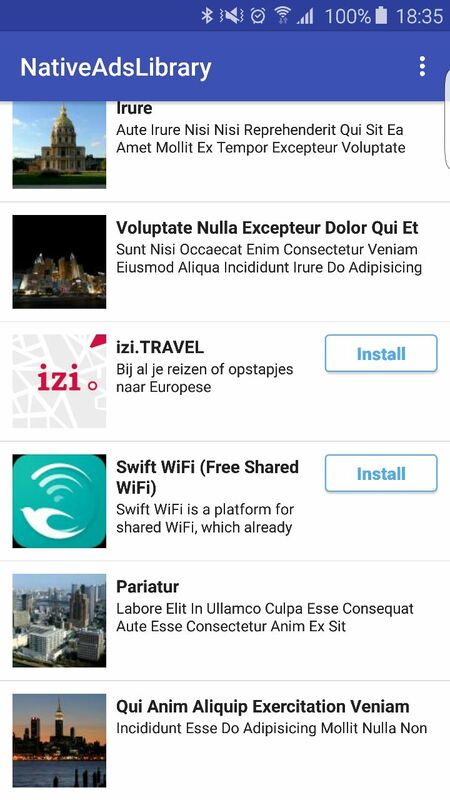 In this repo you will find an example of the usage of the NativeAds library in your own app. It's intended to be totally customizable by you, and that's why provide you the source code. The only thing we need from you is you to download a JSON file with our offers, and display them by opening the click URL we provide you. * Method to download the ads. Initializing the ad request. - debug mode enabled - disable in production! Make sure you modify the ad placement token (4bea87cd5549527b10d2886061121d0f8e22071b). Otherwise we cannot track your ad displays or conversions! In the usual situation, you will be displaying the ads in the onAdRequestSuccess, with the layout of your choice (provided by the library, or customised). appStoreUrl: the preview URL, where the user will be taken. It could be empty. In the class NativeAdDisplayHelper we provide some utility methods to help you displaying the ads, and opening the links in a embedded WebView. The reason why this is done this way is because the urls of the ads point to tracking domains that will save the clicks of your users for us to know what it was your user who clicked on an ad. To improve the user experience, this process happens in-app. By getting an instance of the NativeAdDisplayHelper class, providing an Activity, you'll be able to open the ad within the app. It will follow the redirects in a webview, and the moment the final URL is reached, if it's a Google Play one, it will open the native app. The aim of this is making the process of showing and clicking on an ad as smooth as possible for the users, to maximize the potential conversion, while keeping a great user experience. In the usual cases, you won't need to edit the library itself. You could even create a ticket for us to make the changes. But the project is open source, and you could do it, if you want to customise it even further. The library project uses a gradle.properties file with the settings to deploy the library to the snapshots repository of your choice. This file is ignored by default, and the properties to be used are in the sample gradle.properties.sample. In order to build and publish the library to your snapshots repository, you will need to create the settings file and customize it with the correct values. We accept contributions from external developers. You can also create your own fork of our code to customize it even more, as our library development is open and transparent, in order to save you time when implementing our ads platform. If you don't feel like solving the problem yourself, feel free to report it to us, and we will take it to our backlog and try to solve it as soon as possible. I have problems: Who do I talk to? We work for you - and we want to solve any problem you may have, or hear from your suggestions, recommendations, or anything that comes to your mind while using this project. Feel free to reach us any time, we'll be happy to help!